Now, this is more like it. After having flirted with impressive iSUPs (inflatable boards) such as the Tower Xplorer, I am back to my old love: hardwood boards. 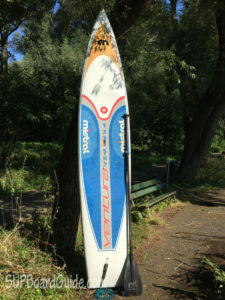 My feet have been itching to get on top of a traditional SUP again and the Mistral Ventura 12”6’ turned out to be a perfect choice. 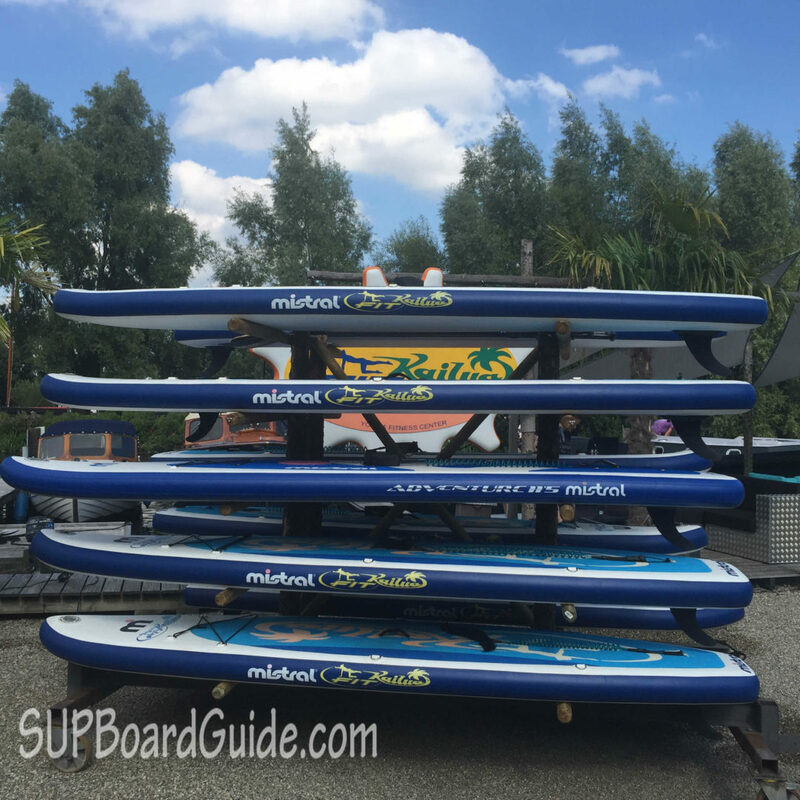 Mistral has been releasing an impressive range of SUPs and iSUPs (like the Kailua I reviewed recently). With an equal emphasis on style and performance, their boards have been creating a mark both outside the water and on it. The Ventura slots into this category. Mistral has released two variations of the same board. One is the 12’6” option, and the other is the 14’ option. This review focuses on the former. The Ventura has been built for a singular purpose – speed. Everything about the board screams fast, faster. Take the body design, for instance. 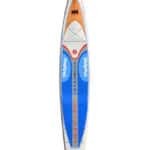 The SUP tapers sharply towards the front. You could probably pierce something with the board’s nose, it is that sharp. And not without reason. The designers have crafted a shape that will not simply course through water, but cut through it with minimum fuss. When translated to performance, you create less resistance, less drag, and more power when you paddle. When speed is the focus, you need a board that is light of weight yet durable. The Ventura has been crafted from premium wood and fiberglass, compressed together in multiple layers to give the board a strong, tough, yet feather-light core. When you take it out on the water, you will not feel the dimensions of the board, only its smooth glide. 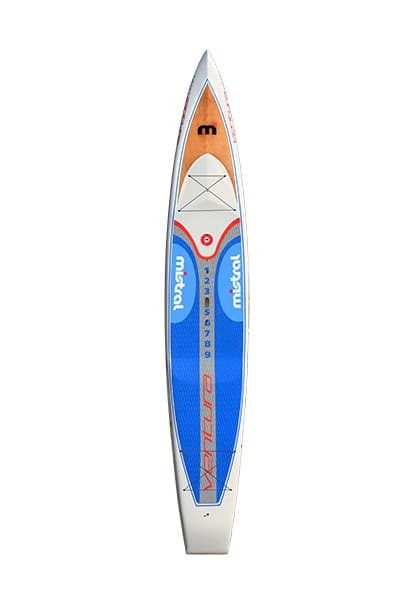 The Mistral SUP contends to be one of the lightest boards in its segment. The relatively narrow width of the board, 27.5 inches, means there is less of the SUP for you to push through the water. This need for speed requires you to have a certain amount of balance on the board. It’s not the first board you want to try out as a newbie. However, the Ventura is not all about speed. 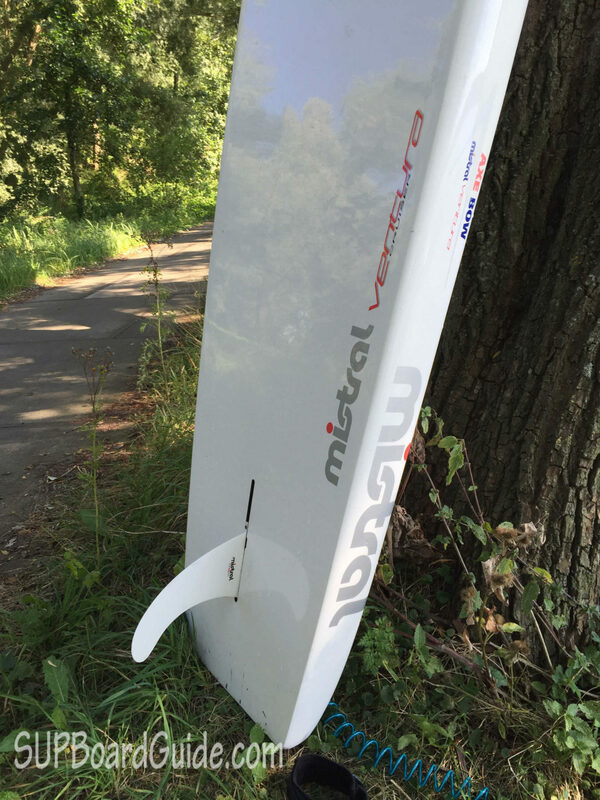 Mistral has tried to create a fast board, but not at the cost of stability. The tail end of the board is square-ish in shape and flat. This allows the board to retain its balance on the water as you go full throttle, pumping your paddle like a piston. This is a nice touch, although I have preferred the tail to have a bit more curvature, which would have added more speed and thrust to the board. 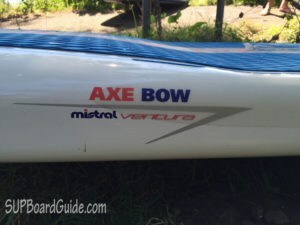 You can tell how much thought and effort goes into making a Mistral board with the unique bow shape that the speedy Ventura is blessed with. Most boards that I encounter possess a flat top. The Mistral board has a slight depression cut through the middle: It starts near the front and ends near the tail. This unique depression has been created to enhance the board’s shape in the water. 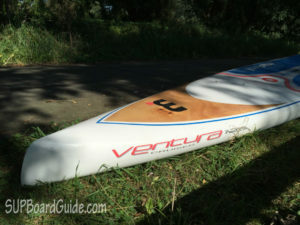 The Ventura is able to slice through the surface, instead of pushing along like the other, traditional boards. The result is a clean ride through flat-waters with a minimum of effort. The unique shape of the Mistral SUP also allows the board to sit lower in the water with a minimum center of gravity. What this translates into is an enhanced drive forward with each paddle stroke. And the closer you feel to the water, the more you can maneuver the board with minimum effort. The Ventura has been built to go as fast as it possibly can on the water, which makes it an ideal board to tour on. The best part is that you can use the board in a variety of water conditions, ranging from the calm lake waters to the more challenging choppy ocean waters. I will tell you why. The board’s bow shape, which I talked about earlier, gives the nose a lift above the water surface. This allows you to slice and cut through small waves and turbulent currents, instead of passing through them. If you stand near the board’s tail, you can place your preferred foot in the depression created by the shape, which is a bit lower, and keep your weaker foot a bit higher on the board. The result: better control over the board with quick turns. The same lifted nose also enables the board to sliver past the flat waters at an impressive speed. The flow lines of the board coupled with the bow shape gives an acceleration to the board, not impeded by either aerodynamic or aquatic drag. You are then able to cover more distance with fewer paddle strokes. The Ventura’s superior glide will take care of the rest. Note: The pictures don’t show the bungee cords, but they can be attached. I have spoken about the SUP’s performance that makes it an impressive touring board, but the Ventura offers more reason to take it out for long rides. Case in point, the pair of bungee cords. The first bungee cord is attached near the nose and can be used to secure additional gear or food and drinks if you wish to drink and dine on the lake. As far as calm waters are concerned, you can use the second bungee cord as well to stow equipment. If the conditions are choppy, the second cord comes in handy. You can secure your equipment away from the turbulent waters. A feature that I liked very much. 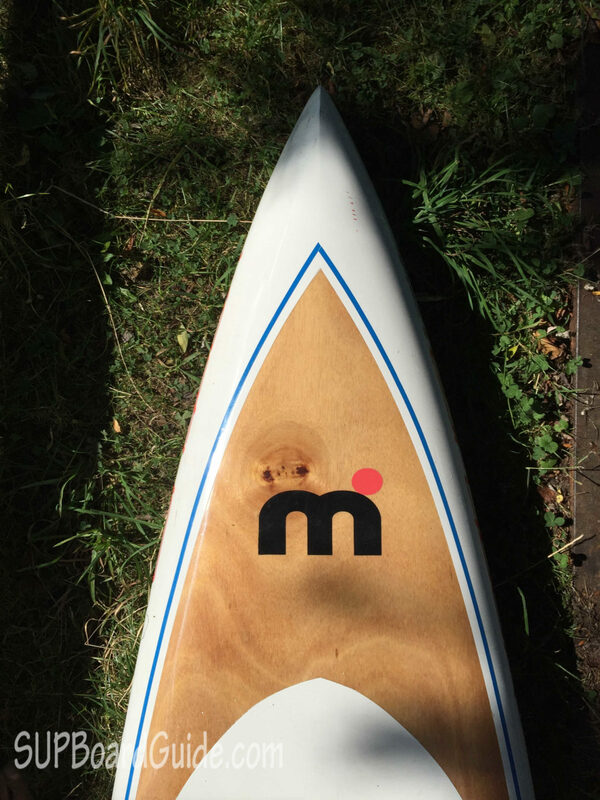 The Mistral SUP comes with a single central fin. It boosts the tracking abilities of the board, allowing you to paddle straight and fast on a still water surface. The lone fin acts as an additional thrust, combining with the unique bow shape to generate maximum speed with each and every stroke. The one downside I felt with just a single fin is that it limits the board’s potential when it encounters waves. Mistral could have provided more flexibility with removable fins or a 2+1 setup. When it comes to creating a style statement, Mistral boards are never far away. For all of the talk regarding Ventura’s performance, I must add that it is quite a looker too. A wooden finish with the maker’s logo creates a nice contrast on the nose to the generally white body. The extended EVA deck pad occupies the center of the board with a blue touch. A grey line runs along the spine of the deck pad with orange bordering its top. The palette of pleasing colors gives Ventura a distinctive look and style. The Mistral Ventura tries to bridge the gap between a touring and a race board and mostly succeeds. The board does not let down on the performance front when tested in flat waters and white waters. It makes good on its promise of providing a fast touring yet stable cruising experience.